The thought of soaking up the sun from the comfort of chic outdoor seating is definitely a dream of mine, as it’s 35 degrees and raining outside while I write this post! 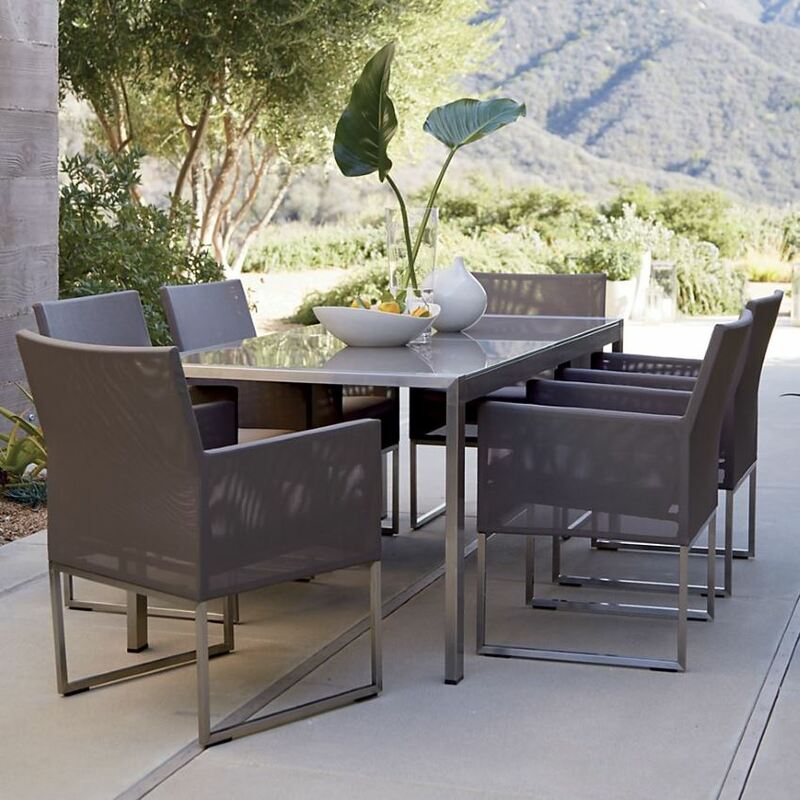 Kate here, and today I’m celebrating the warmer weather that will be here in a few weeks by sharing some outdoor seating solutions that deserve a second look. From lounge seating to dining seating, there’s something for everyone in the images that follow. 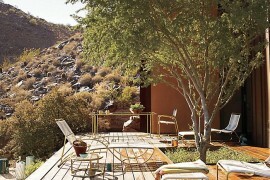 And even if you’re not in the market for patio furniture, the photos below are filled with outdoor design inspiration. Enjoy! 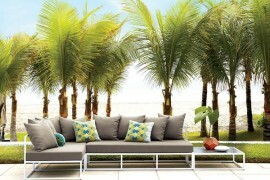 Large outdoor seating solutions are growing in popularity, especially since sectional sofa style is no longer a thing of the past. 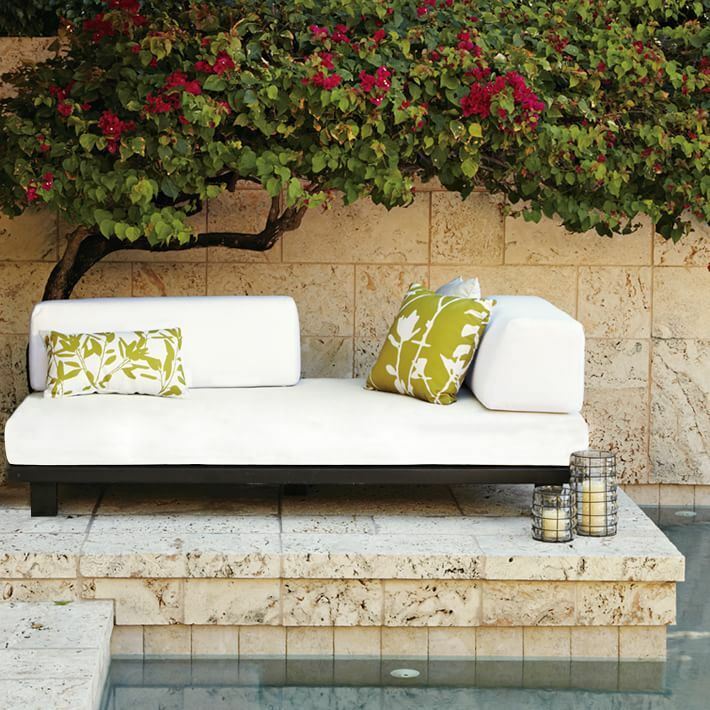 Below we see the Casbah Outdoor Sectional from CB2, which features a rust-resistant aluminum frame finished in a bright shade of powdercoated hi-gloss white. Another bonus: the piece is lighter than it looks, making it easy to move as needed! 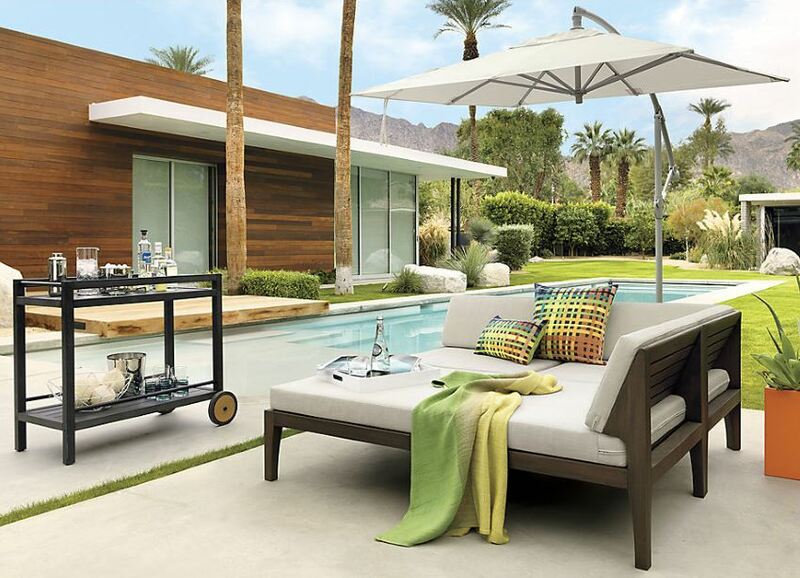 Designed by Sean Dare, the Java Outdoor Sectional from CB2 illustrates the powerful contrast of rich stained wood and bone-colored cushions. Weather-resistant polyester makes this piece extra durable, especially since the covers can be removed for cleaning purposes. Colorful plants and a colorful wall are two standout elements found in the images above. 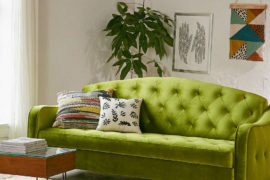 But when the sectional itself is colorful, it’s hard not to look! 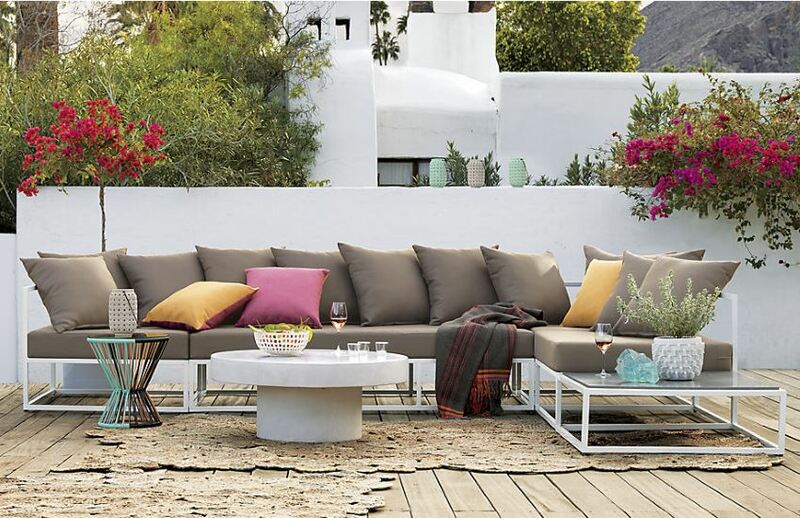 This Morocco 5-Piece Sectional from Crate & Barrel features Sunbrella Sulfur Cushions (they’re mildew-resistant! ), as well as handwoven resin rope. The Tillary Outdoor Sofa from West Elm is a compact statement piece crafted from sustainably harvested wood. 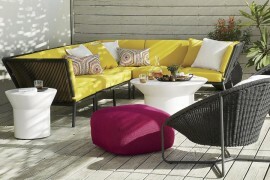 Weighted back cushions make it possible to create different configurations. 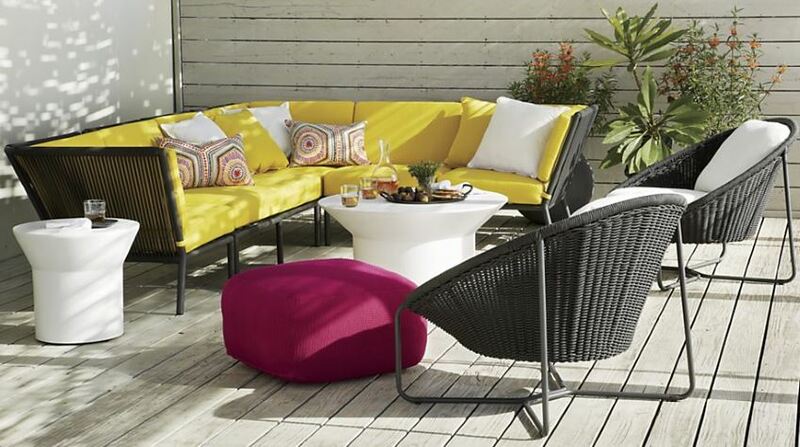 Because changing up the look of your outdoor seating from time to time can really refresh your space! There’s nothing like a lounge chair to set a relaxing tone outdoors! Last summer I created an outdoor lounge on a budget. A very tight budget. 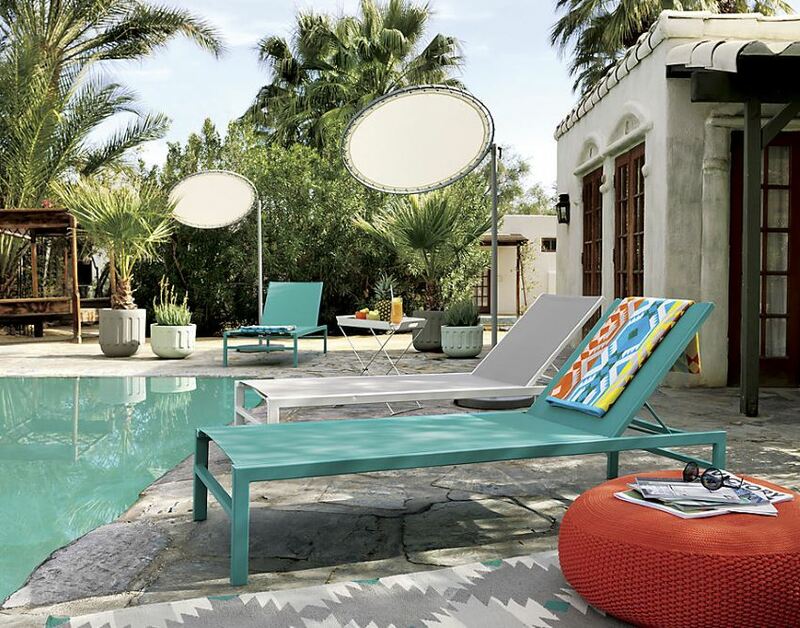 On that note, this Idle Turquoise Outdoor Chaise Lounge from CB2 is a budget-friendly piece that adds a bright dash of turquoise to your patio or deck. Enjoy upright seating or lay the piece flat for true lounging. There’s something timelessly classic about the Rochester Single Chaise from Restoration Hardware. If you like what you see below, keep in mind that this piece is available in a variety of finishes, colors and fabrics for your convenience. Side note: how refreshing are those white curtains in the background?! 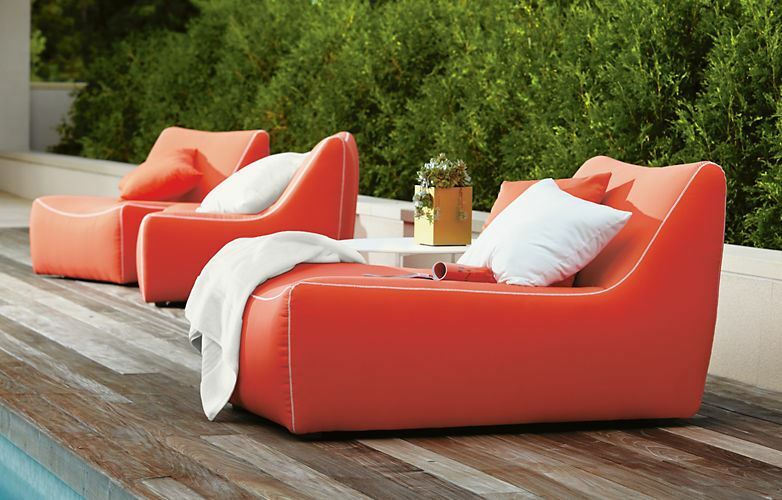 Foam cushioning and a radiant orange hue combine in the Maya Chaise from Room & Board, which is large enough to seat two. While this seating option may appear to be too nice for the outdoors, keep in mind that it’s crafted from marine-grade plywood, quick-drying foam and weather-resistant fabric! 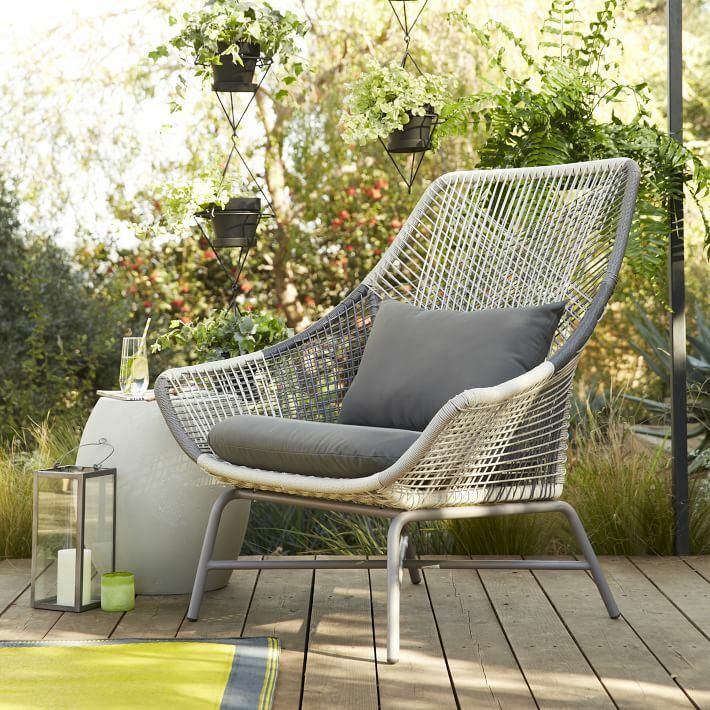 For a unique take on lounge seating, check out the Huron Large Lounge Chair in Gray/Seal from West Elm, made from all-weather cord cleverly woven around an aluminum frame. This rust-resistant piece can be combined with the Huron Ottoman to create the perfect “put your feet up” grouping. And if you’re wondering about the amazing planters in the background, they’re West Elm’s hanging wire pot brackets. 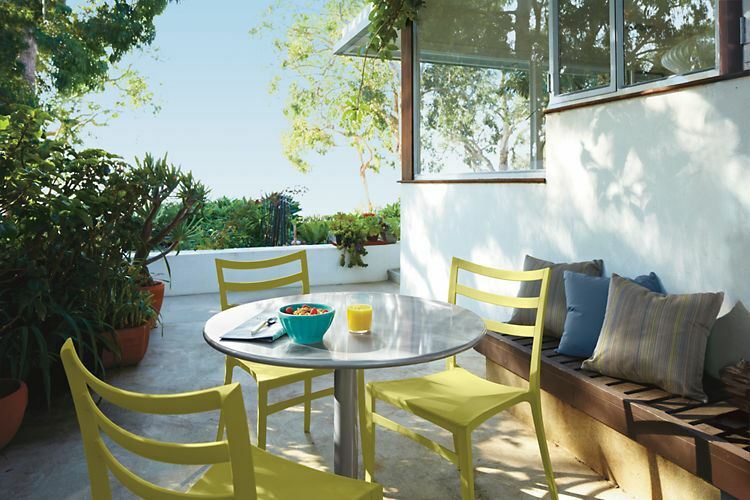 Why is turquoise such a popular color for outdoor seating? Perhaps because it evokes the crisp hue of the sky, or the soothing shade of the ocean. 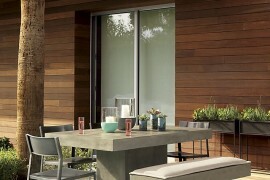 If blue isn’t your thing, take note that this Cruz Lounge Chair from Room & Board is available in a variety of colors. Today’s final lounge seating solution: the Ibiza Collection from Restoration Hardware, particularly the Ibiza Lounge Chair. This piece is a modern twist on the traditional bean bag chair. 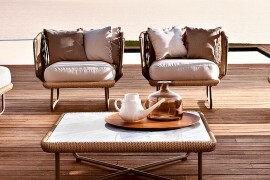 A laid-back form covered in all-weather upholstery makes the chair as functional as it is stylish. And yes, like a bean bag chair, this seating is filled with foam and beads! 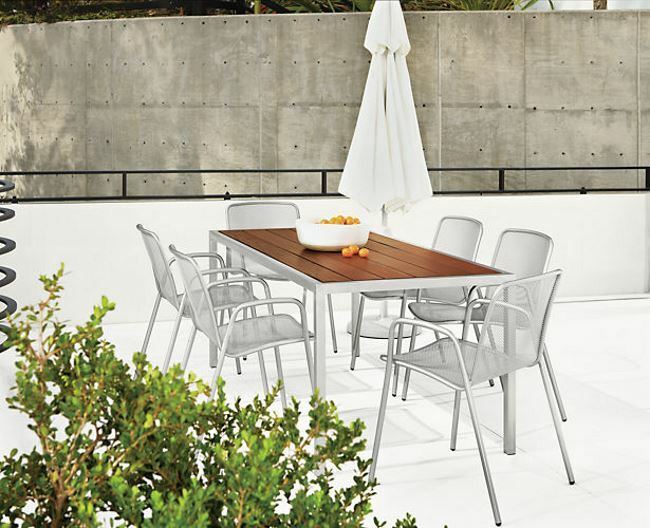 If you enjoy outdoor entertaining, a standout dining arrangement is a must. Since today’s post focuses on seating, I’ll be pointing you to the chairs in the collections that follow. The Montecito Side Chair from Restoration Hardware evokes 1950s Hollywood glamour, thanks to a brass frame covered in woven straps. Grey and sleek. These two words describe the Dune collection from Crate & Barrel. 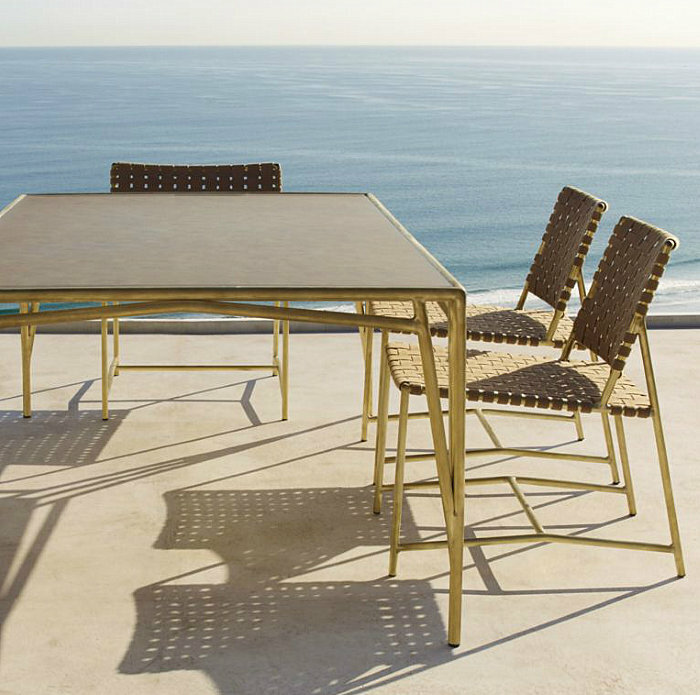 The Dune Dining Chair boasts an outdoor-grade stainless steel frame covered in taupe Batyline® synthetic mesh. This is durable mesh, folks. It won’t fade, mold, tear or stain. 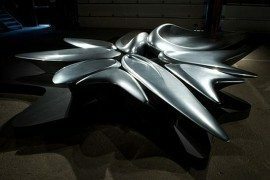 If only indoor furniture were this tough! The Aruba Chair from Room & Board is stackable, making it easy to store or stash aside when needed. As shown below, this chair truly shines when contrasted with wooden tones. 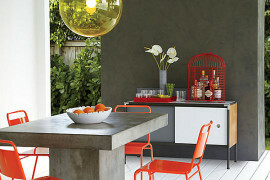 Shown in green, the Sabina Chair from Room & Board comes in a range of colors, and it’s as lightweight as it is durable. The molded plastic piece, designed by Casprini, is inspired by Italian café seating. 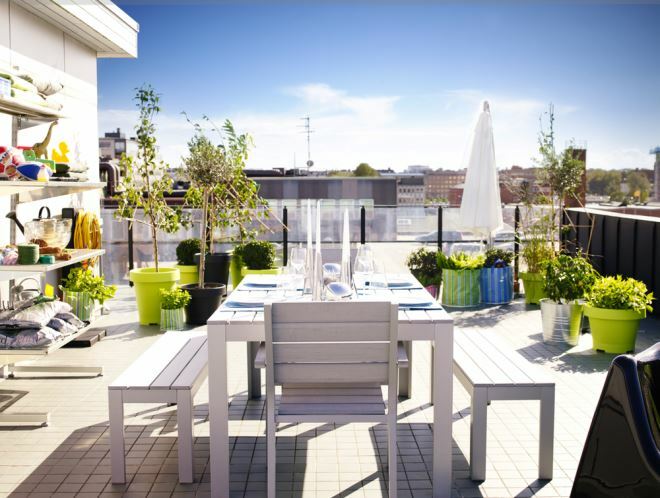 Don’t forget the icing on the outdoor seating cake…like an umbrella to shade yourself from the spring and summer sun. 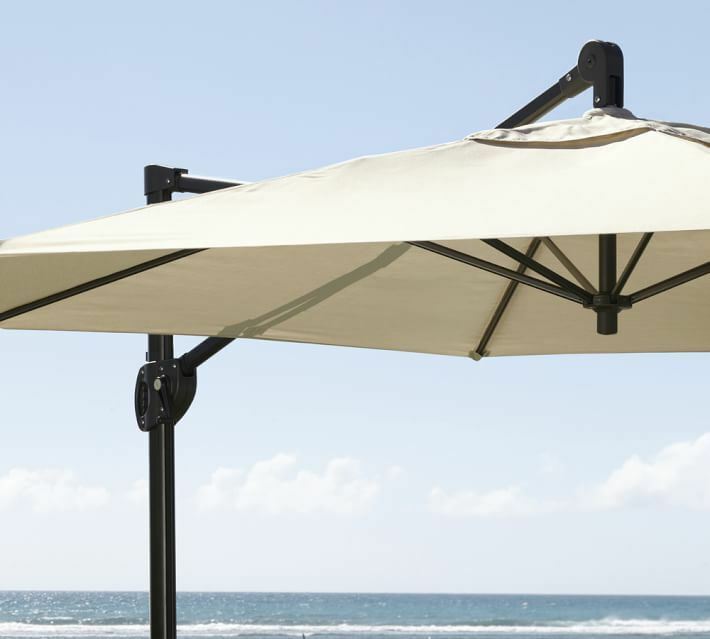 This Round Cantilever Umbrella from Pottery Barn features an arched arm on a vertical pole, making it easy to adjust the height. The canopy can also be angled for your convenience. 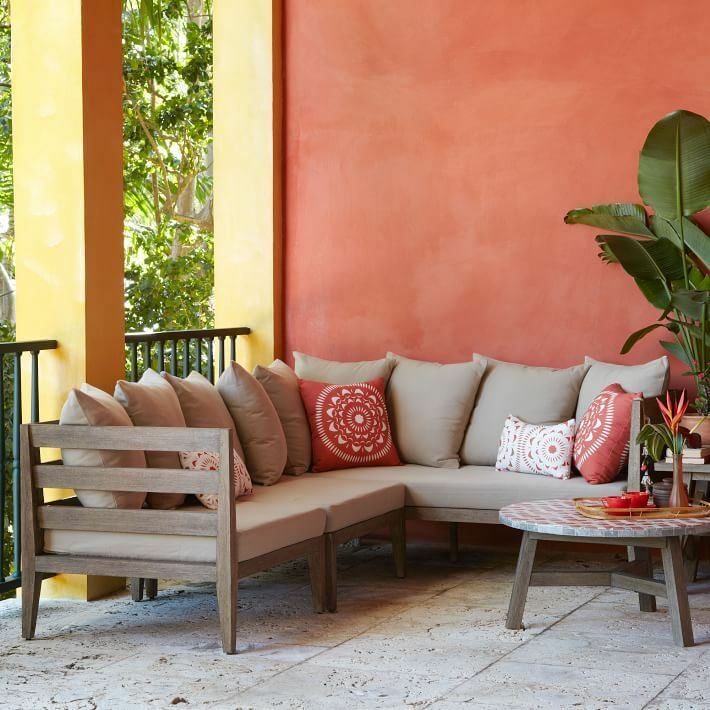 If your seating doesn’t come with pillows, add a few cushions, such as these Sunbrella Contrast Solid Piped Indoor/Outdoor Pillows from Pottery Barn. 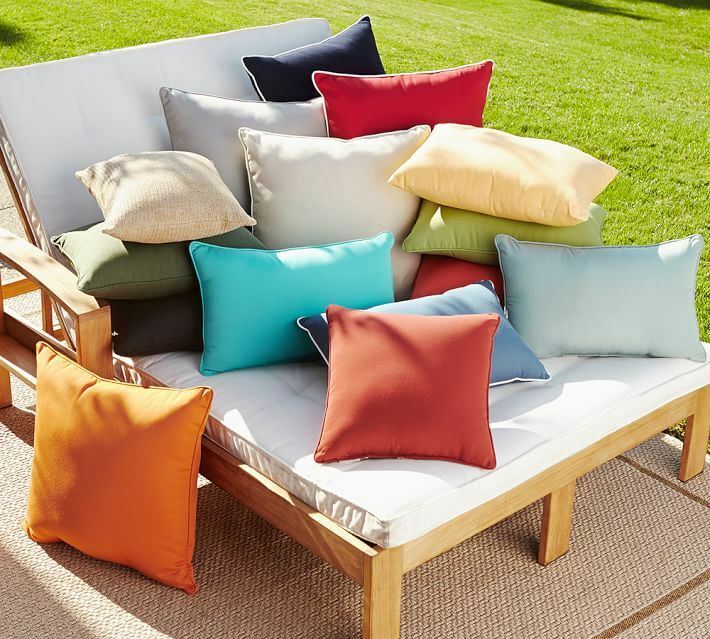 A popular choice for today’s outdoor vignettes: choosing colorful accent pillows to adorn seating with neutral upholstery.